This apartment is situated next to Piazzale degli Eroi, near S. Peter’s Cathedral, within a very quiet complex from the 40’s with a pleasant garden, on the 3rd floor without lift. It is located within a very quiet area; nevertheless its vicinity to metro station Cipro - Musei Vaticani) is a perfect point where you can start any sightseeing tour. Moreover, the ‘Prati area’ is surrounded of many shops and amenities of any kind, including restaurants for any taste and budget. The dining room includes a double sleeping couch and colour TV; from here, a sliding door gives access to the kitchen, fully equipped with oven, fridge and dish washer. On the opposite side you will find a very cosy double bed room with a handy and spacious wardrobe. The bathroom has a bath tub with hydro massage and a washing machine. 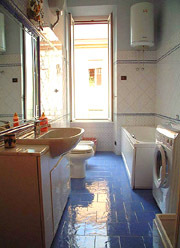 This lovely apartment is in very good conditions, since it has recently been restored and furnished. Furnished in a very soft and functional way, this flat also boasts a very efficient independent heating system, air conditioning and will provide you with all necessary, including bed sheets (that are changed once a week). Ideal to accommodate up to 4 people. 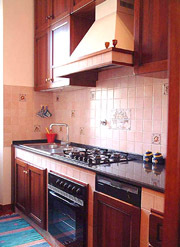 Fully equipped kitchen with fridge, freezer, oven, washing machine and dishwasher. The large bathroom has a shower. The apartment is fully equipped and linen is changed once a week. Other services are available upon request.